Gottlieb Eliel Saarinen (August 20, 1873, Rantasalmi, Finland – July 1, 1950, Bloomfield Hills, Michigan, United States) was a Finnish architect who became famous for his art nouveau buildings in the early years of the 20th century. Saarinen was educated in Helsinki at the Helsinki University of Technology. From 1896 to 1905 he worked as a partner with Herman Gesellius and Armas Lindgren at the firm Gesellius, Lindgren, and Saarinen. His first major work with the firm, the Finnish pavilion at the World Fair of 1900, exhibited an extraordinary convergence of stylistic influences: Finnish wooden architecture, the British Gothic Revival, and the Jugendstil. Saarinen's early manner was later christened the Finnish National Romanticism and culminated in the Helsinki Central railway station (designed 1904, constructed 1910-14). Between 1902 and 1912, he was also co-author of the design for the Fennia series, produced by Arabia pottery. From 1910–15 he worked on the extensive city-planning project of Munksnäs-Haga and later published a book on the subject. In January 1911 he became a consultant in city planning for Reval, Estonia and was invited to Budapest to advise in city development. In 1912, a brochure written by Saarinen about the planning problems of Budapest was published. In April 1913 he received the first place award in an international competition for his plan of Reval. During 1917-18 Saarinen worked on the city-plan for greater Helsinki. He also designed the Finnish markka banknotes introduced in 1922. After the divorce from his first wife, Mathilde (who then married Herman Gesellius), on March 6, 1904 Saarinen married his second wife, Louise (Loja) Gesellius, a sculptor in Helsinki, and the younger sister of Herman Gesellius. They had a daughter Eva-Lisa (Pipsan) on March 31, 1905 and a son Eero on August 20, 1910. Eliel Saarinen moved to the United States in 1923 after his noted competition entry for the Tribune Tower in Chicago, Illinois. Although Saarinen's entry won second place and was not built in Chicago, his design was fully realized in the 1929 Gulf Building in Houston, Texas. Saarinen first settled in Evanston, Illinois, where he worked on his scheme for the development of the Chicago lake front. In 1924 he became a visiting professor at the University of Michigan. In 1925 George Gough Booth asked him to design the campus of Cranbrook Educational Community, intended as an American equivalent to the Bauhaus. 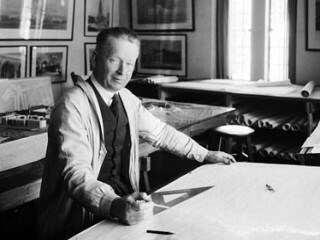 Saarinen taught there and became president of the Cranbrook Academy of Art in 1932. Among his student-collaborators were Ray Eames (then Ray Kaiser) and Charles Eames; Saarinen influenced their subsequent furniture design. His son, Eero (1910–1961), became one of the most important American architects of the mid-20th century, as one of the leaders of the International style. Saarinen's student Edmund N. Bacon achieved national prominence as Executive Director of the Philadelphia City Planning Commission from 1949 to 1970. View the full website biography of Eliel Saarinen.